The impression here is that the weight is being pushed against the left foot. It looks inside. The left knee has moved horizontally forward and around in a semicircle. Because this movement has been horizontal the left heel has been lifted. The right leg is taut and nearly straight . . . not quite straight. The weight has remained central as at the address so the right leg is not vertical. The hips are horizontal (like the knees). The right hip has not sagged or moved laterally; it has turned straight back. The shoulders have turned horizontally to the spine. Because of the upright stancethe spine being very little inclined forward  the shoulders have not dipped appreciably. The left shoulder has not dipped, but it has come under and along to the chin. 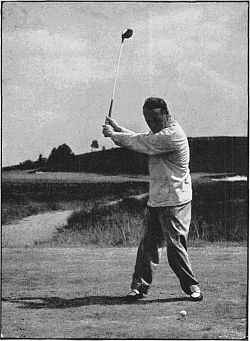 The left arm is not stiff but it is straight, and the hands are held out as wide as possible. This is the region of the reverse. The arms are near their top, but the wrists have still to break back fully as the left heel returns back tc the ground.